Metallic Silver Paint Used for a "Living Statue"
A week or two ago I got a call from Hannah in Pennsylvania, desperately in need of some metallic silver paint asap. She was having trouble finding any retailers who would answer their phones! I was very happy that I had some in stock and was able to ship it out to her right away, just in time for her big event. 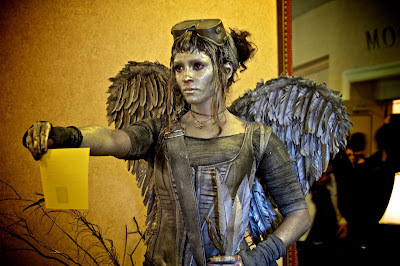 She used it to act as a living statue (above) while handing out flyers for her friend Jason of Seventh Wave Studio, who was giving a workshop at the 15th annual Millennium Music Conference in Harrisburg, PA. Thank you for sharing your photo, Hannah, and I'm so happy the paints worked out well for you! Your costume turned out totally AMAZING! !